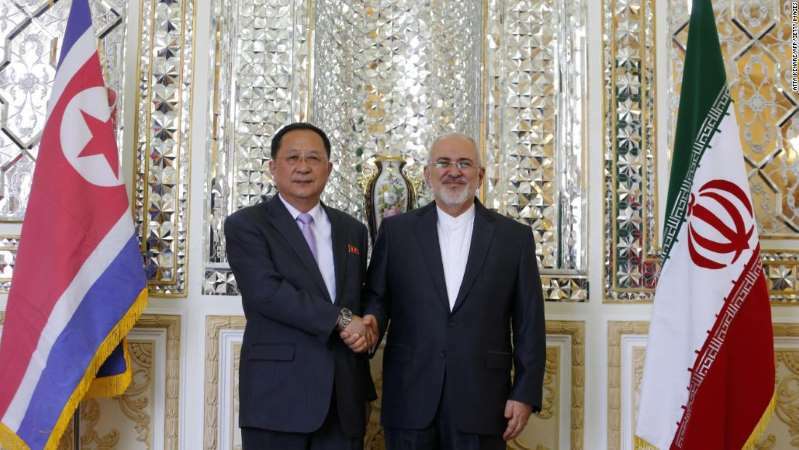 Iranian Foreign Minister Mohammad Javad Zarif welcomed his North Korean counterpart, Ri Yong Ho, to Tehran on Tuesday, hours after the United States reintroduced sanctions against the Islamic Republic. The state-run Islamic Republic News Agency reported the two officials met and "expressed satisfaction with existing bilateral relations and called for further expansion of ties." Without any specific details, the agency added that "they also discussed the latest regional and international developments, as well as issues of mutual interest." It was the first visit by a senior North Korean official to Iran during the second term of Iranian President Hassan Rouhani and was made upon a request by the North Korean foreign minister, IRNA said. [post_ads]Earlier Tuesday, President Donald Trump posted his latest Twitter message, cautioning countries against doing business with Iran. "I am asking for WORLD PEACE, nothing less!" Trump added. Trump ended US participation in the Iranian nuclear deal -- orchestrated by the Obama administration -- in May. He has long been a fierce critic of the agreement -- even before he was a presidential candidate -- and has called it "insane." Trump maintains that, even with the current restrictions in place, Iran continues to pose a threat to the United States. The visit from North Korea coincided with the first round of reimposed sanctions Tuesday that target, among other things, the purchase or acquisition of US dollars by the Iranian government, the country's auto industry and trade in gold or precious metals. German car manufacturer Daimler confirmed it had abandoned plans to expand in Iran as the measures kicked back in. A second phase of US measures are due to go into effect in November and will affect Iran's crucial oil industry.